"My mother-in-law gave this recipe to me, and I get compliments all the time." In a large bowl, blend together butter or margarine, white sugar, 1/2 cup brown sugar, sour cream, eggs, and vanilla. Add to these ingredients the flour, baking powder, and soda. Blend until smooth. To Make Filling: Combine cinnamon and 1/4 cup brown sugar. Grease and flour a large Bundt pan. Pour 1/2 of the batter into the prepared pan. Sprinkle the cinnamon sugar mix on top of the batter in the pan, and cover with the remaining batter. Bake at 350 degrees F (175 degrees C) for 45 to 50 minutes. Cool. Make a thick glaze by mixing together confectioners' sugar with 2 to 3 tablespoons milk until smooth. Pour over cooled cake, and add sprinkles if desired. Blueberries, cinnamon-sugar, and pecans—wake up to a bite of the Big Yummy! 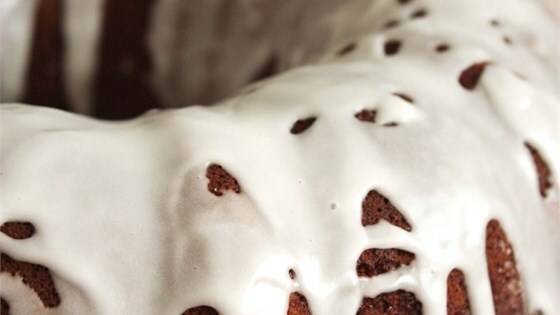 VERY good coffee cake! Has just the right amount of sweetness. I made the glaze but instead of putting sprinkles, I sprinkled on some leftover chopped walnuts. It looked beautiful!